These beginning piano lessons focus on technique. 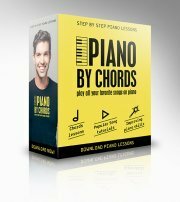 I gathered here a collection of information and useful piano exercises to help you improve you skills when learning to play the piano. The order of the issues here is organized gradually according to matter of importance and difficulty. "Thanks a bunch. Took lessons as a child and now in thirties starting back to the basics with the help from a young genius. Thanks again." Fingers have numbers. In this lesson we'll learn about the numbers of the fingers and about the correct way to position your hand on the piano. Here are the Ten Commandments for the correct piano playing posture. This page deals with the basic movements concerning piano playing. By thinking about these small movements and exploring it you can achieve a great level of sensitivity, fluency and even more important avoid stress or make it go away. In this page you'll find four main ways to connect between two piano keys. Being able to produce these four manners will enrich your piano playing and allow you to express different emotions. Here's how to play loud, soft or get gradually louder or softer on the piano. A great article about the different musical signs. These piano exercises will help you to acquire dexterity in your fingers so don't miss the change to practice them. They're nice to do. In this piano technique lesson we'll learn to play the piano with the sustain pedal. This will add a lot of colour to our sounds. I've been asked by many of you to describe the different technique of how you could play piano fingerings. There it is. Here's how to play Glissando on the piano. How to play the Appoggiatura on piano. Some people confuse the Acciaccatura with the Appoggiatura. Here's a clear article over this beautiful piano ornament that will clarify the difference. There are various way to play piano trill on the piano. Here's a great free piano lesson the deals with all of them concerning their piano technique. The mordent is a beautiful piano ornament that is often played on various music periods. Here's a lesson that shade light on this ornament. A clear explanation followed by a handy table that shows all the different musical baroque ornament.